c. y=f(x+p), where p is a constant . On each diagram show the coordinates of any points where the curve intersects the x-axis and of any minimum or maximum points. From the above table, as highlighted, it is evident that we are required to transform the function into , where , therefore it is case of horizontal shrinking of the given function. Transformation of the function into results from shrinking of in x- direction by a scale factor of . Shrinking of the function in x-direction by a scale factor of transforms into . Hence, the new function has all the y-coordinates same as that of the original given function whereas all the x-coordinates are half of the original given function. It is shown in the figure below. Orange graph is the original one whereas red represents the transformed graph. 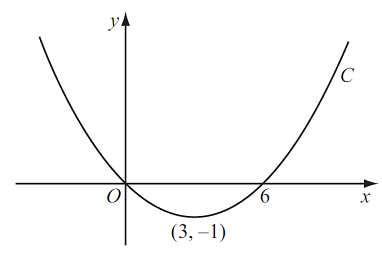 Transformation of the function into results from reflection of in x-axis. Reflection of the function in x-axis transforms into . It is evident that we are required to transform the function into , therefore it is case of reflection of the given function in x-axis. It is also evident from the above table that only y-coordinates of the graph change whereas x- coordinates of the graph will remain unchanged. Hence, the new function has all the x-coordinates same as that of original given function whereas all the y-coordinates are negative of original given function. It is shown in the figure below. Orange graph is the original one whereas blue represents the transformed graph. It is evident from the given diagram that minimum point of the graph is (3,-1). It is evident that we are required to transform the function into , therefore it is case of translation of along negative x-axis by a units. However, this graph may have any position shifted towards negative x-axis by p units. The extremes are when p=1 (the green sketch) and when p=3 (the blue graph), in the figure below, the actual graph for will be somewhere between these extreme positions.